Like most churches this time of year, we are already preparing for the coming Christmas season. Since some of the best learning comes from looking back, I thought I’d share a few Christmas communication lessons from last year. We view Christmas as a prime opportunity to appeal to newcomers. 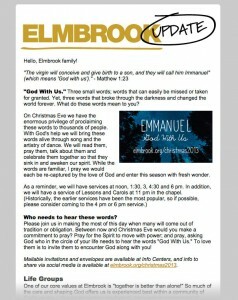 Elmbrook Church is a single-campus megachurch, with an average weekend attendance between 4,500 and 5,000. At Christmas, we typically see about 10,000 individuals come through our doors, many of whom have little or no affiliation to a home church. For that reason, we view Christmas as a prime opportunity to appeal to newcomers. We faced two unique challenges in 2013. One was that we were seven months into a 15-month gap between senior pastors. Our congregation had mixed levels of commitment to the church. Many were in “wait and see” mode. The second challenge, related to the first, was that giving was down considerably from the prior year. We made budget cuts in many places to match giving. As a result, the promotion budget was cut in half. I was committed to doing more with less. 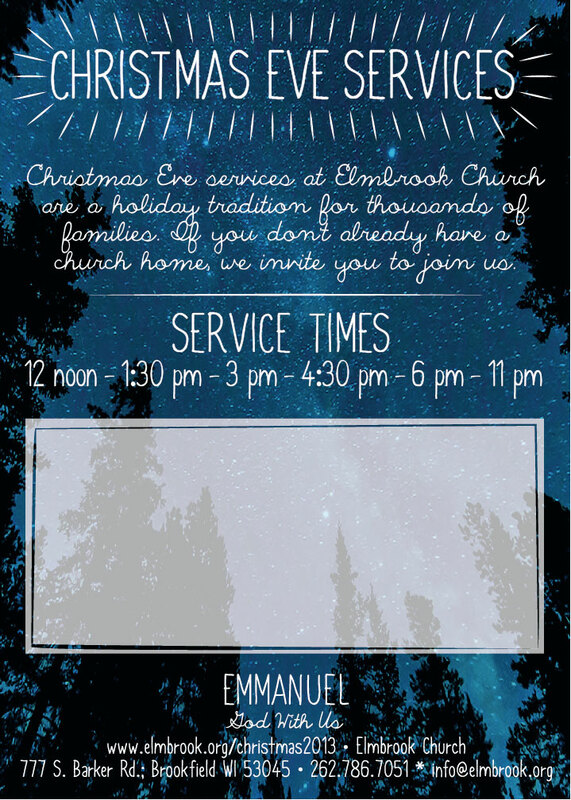 Our communication team’s objective was to do what we could to keep Christmas attendance at or above that of previous years. We accomplished this—with help from the Holy Spirit! Estimated attendance was about the same as in 2012. We celebrated this as a small victory. Ads in community newspapers’ church directories the week before. A large road sign containing service times on a high-visibility section of our property. An all-church email from the interim senior pastor to our email list of 11,600+ encouraging them to pick up invitations and envelopes in the coming weekends and invite a friend (Figure C). A small giveaway for attendees. Facebook posts promoting Christmas Eve, including photo images. Twitter posts that were basically repurposed Facebook posts. I did not do any additional advertising in the community, such as Christmas cards mailed to local residents, yard signs, a billboard or any of the other more costly things we had done in the past. 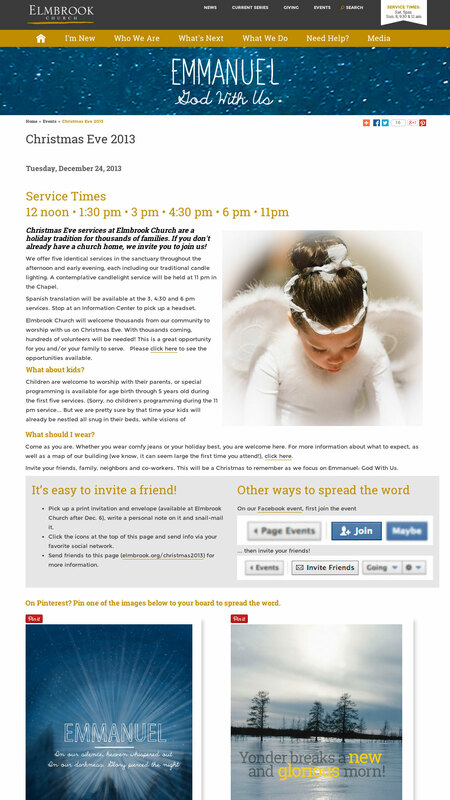 I added to the website event page a social media “how to” section to make it invitation-friendly (Figure A). We stuffed invitation cards into bulletins three weeks prior (Figure B). We had envelopes available that people could use to mail the invitations. We left room in the design for a personal note. I sent an email to staff explaining how to share on Facebook and how to invite friends to Christmas services via social media. Our café printed coffee sleeves that promoted Christmas, with “invite a friend” and the URL. I added images to the website created specifically for Pinterest, which linked back to the website event page. 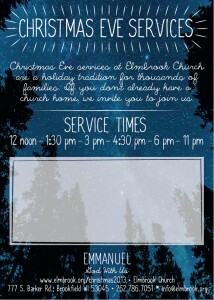 I ran a Facebook promoted post about Christmas Eve services, driving people to the website event page. With Facebook’s targeting abilities, I selected that it only be shown to those who were not already fans of the church and who lived within a 15 mile radius. It cost about $175 to get in the news feed of thousands of individuals in our community. I paid per click on the ad, so I knew they made it to our web page. There were 4,931 visitors to our website event page. Of those, 1,271 landed there directly via the event URL. There were over 1,500 social shares of the website event page. This means these folks were on the event page and shared it via the sharing icons at the top of the page. As already stated, attendance was level with the prior year. Objective met! Many people are not confident navigating the brave new world of social media without a little guidance. A number of people told me that the social media “how to” on the event page was helpful. I’ve leveraged this concept since then in other situations where I want folks to support our social media efforts. Apparently, many people are not confident navigating the brave new world of social media without a little guidance. Not surprisingly, the Facebook posts with images got much better engagement than posts without. I’ve increased our mix of image posts in Facebook throughout the year. This has made a big difference in boosting audience engagement. I plan to be more strategic with Pinterest and Facebook images, creating several in advance, and scheduling them to post periodically so fans start to expect them from us periodically. Based on feedback, I realized that we have two audiences coming to the website event page, and only a portion of them resonate with the “invite a friend” message. So I am going to move the invitation and ‘how-to’ to a separate page. That way, newcomers won’t have to wade through that information to get the nuts-and-bolts of what they want to know. 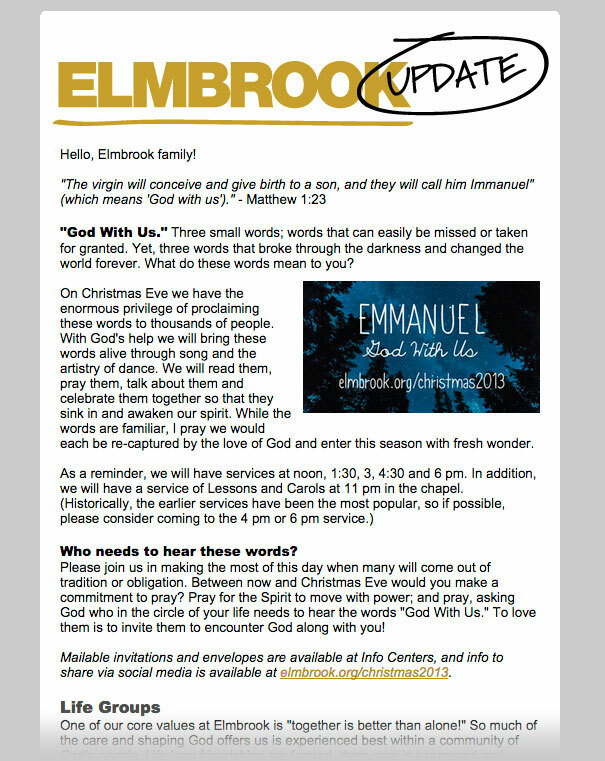 I will spend time sprucing up the content on the “I’m New” and “Weekends at Elmbrook” web pages, which were the pages people visited immediately after the Christmas page. I am also adding links to the Christmas page on all other holiday event pages, such as our women’s Christmas celebration and the holiday ballet performance. How about you? What worked (or didn’t) in your communications strategy last Christmas? 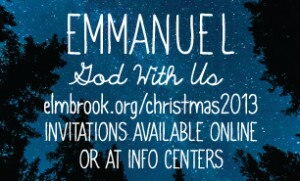 Check out God Rest Ye Stressed Communicators: Planning Christmas for Your Church for help with Christmas. For more Christmas help, the church marketing elves have been making a list (and checking it twice) of Christmas ideas and resources. Karen Shay-Kubiak is director of communications for Elmbrook Church, a single-campus megachurch located in Southeast Wisconsin. She is also a closet tech geek who loves things like Evernote, online forms, project management systems and anything else that promises to help her squeeze more out of a day's 24 hours. Read more posts by Karen Shay-Kubiak | Want to write for us?